The POEMS syndrome is a rare and multisystemic disease characterized by the presence of polyneuropathy, organomegaly, endocrinopathy, presence of M protein, and alterations in the skin. The existence of bone lesions is frequent, being generally blastic or mixed and rarely lytic. We present the case of a 54-year-old male patient diagnosed with POEMS syndrome, with atypical presence of lytic lesions, who was referred for an 18F-fluorodeoxyglucose positron emission tomography-computed tomography (PET-CT) study for initial staging of the process. There were several hypermetabolic foci coinciding with bone lesions, reaching a maximum standardized uptake value of 15 at the level of the right iliac bone with associated soft-tissue mass. PET-CT is an adequate tool for evaluation, diagnosis, and monitoring of the pathology. The scan allows the detection and selection for its biopsy of bone lesions and lymphadenopathies. POEMS syndrome is a rare, multisystemic disease characterized by the presence of polyneuropathy, organomegaly, endocrinopathy, presence of M-protein in the blood and skin alterations. The acronym of its name refers to these pathologies. The prevalence is very low, around 0.3/100,000. The pathogenesis is unknown, although cytokines seem to play an important role. Although the presence of bone lesions is not required for diagnosis, their visualization occurs in up to 97% of patients. In general, these lesions are blastic or mixed, being rarely lytic, in the latter case with a frequency lower than 13% of patients. 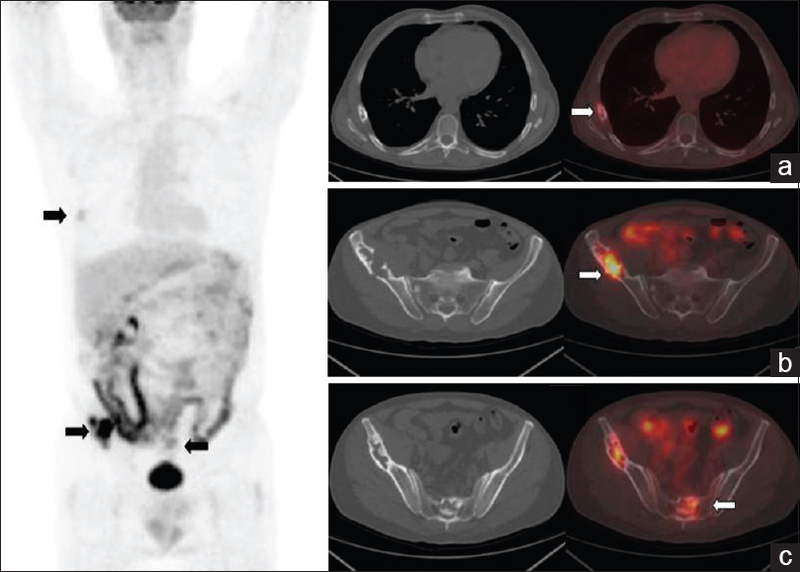 Previous studies have described the usefulness of positron emission tomography-computed tomography (PET-CT) with 18F-fluorodeoxyglucose (18F-FDG) in the evaluation of the disease, showing a greater glucidic metabolism in lytic lesions in relation to blastic and mixed. We present the case of a patient diagnosed with POEMS syndrome, with atypical lytic lesions, who was asked for a metabolic study for staging. A 54-year-old Caucasian male patient who had a stroke with left temporo-occipital ischemia and mild subsequent sequelae. Subjected to clinical study, the patient described in his anamnesis sensation of tingling in lower limbs and clumsiness in walking. There was no history of hypertension or smoking habits and the cardiological study did not show significant alterations. The blood analysis showed polyglobulia, with hematocrit values of 52.5% and hemoglobin of 18 g/dL, thrombocytosis of 562,000 platelets/μL, elevated immunoglobulin G levels (1650 mg/dL) with monoclonal lambda band and vascular endothelial growth factor (VEGF) >1000 pg/mL. The result of electromyography was compatible with proximal demyelinating sensory-motor polyneuropathy, with severe involvement in lower limbs and mild in upper limbs. A CT study reported the presence of lytic lesions at the level of the right iliac blade with associated soft-tissue mass, sacral vertebrae, and right sixth rib. A subsequent magnetic resonance imaging confirmed these findings. With the diagnosis of POEMS syndrome, a PET-CT study was requested for process staging. After the administration of 296 MBq of 18F-FDG, full body images were acquired in a Discovery ST4 hybrid system (General Electric, Milwaukee, USA). The images showed several focal points of glycidic hypermetabolism coinciding with the lytic lesions described in the previous radiological study, reaching a maximum standardized uptake value of 15 at the level of the right iliac bone. The soft-tissue mass associated with the iliac lesion was also visualized, showing hypermetabolic characteristics [Figure 1]. In the rest of the examination, no other hypermetabolic lesion or the presence of visceromegaly or suspicious adenopathies was evident. After imaging studies, the patient received five cycles of treatment with lenalidomide and dexamethasone, along with subcutaneous injections of bemiparin sodium. The patient currently has improved polyneuropathy and decreased analytes blood levels. Also called Takatsuki syndrome, POEMS is a rare paraneoplastic syndrome secondary to plasma cell dyscrasia. First described by Scheinker in 1938, its acronym was introduced by Bardwick et al. in 1980. Although its etiology is unknown, increased blood levels of VEGF are described, correlating its concentrations with disease activity. Overexpression of this cytokine in patient nerves would create abnormal endothelial cell activity, causing microangiopathy. 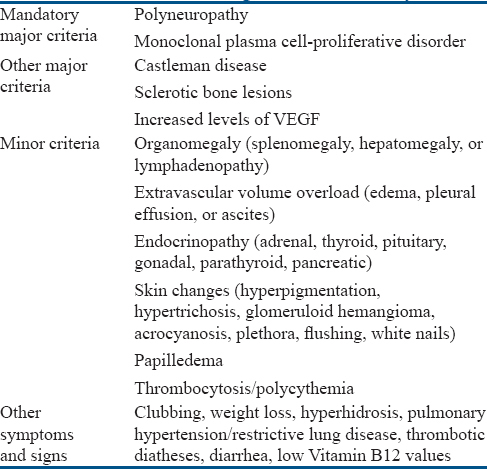 The diagnosis of the syndrome is based on the criteria elaborated by the International Myeloma Working Group, in which mandatory, major and minor criteria are defined, which are listed in [Table 1]. In this way, this diagnosis requires a combination of clinical and diagnostic tests. Neuropathy is the dominant pathology, being generally peripheral, ascending, symmetrical, and both motor and sensory. Almost half of the patients present with thrombocytosis or erythrocytosis. Organomegaly affects the liver, spleen, or lymph nodes. Within endocrinopathies, hypogonadism is the most frequent alteration, being hyperpigmentation, hypertrichosis, or lipodystrophy the most described skin lesions. On the other hand, Castleman's disease is evident in 11%–30% of patients. Most of the patients present bone lesions, between 41% and 56% of which are purely sclerotic and therefore, the pathology is histologically known as osteosclerotic myeloma. However, lytic lesions are rare, generally located in the spine, pelvis, ribs, and proximal portion of the extremities. The imaging techniques used for its evaluation have been simple radiology and CT, but there may be false negatives and difficulty in selecting the most suitable lesion for biopsy. About the role of nuclear medicine, bone involvement showed high uptake in bone scintigraphy with diphosphonate derivatives and increased glycidic metabolism with 18F-FDG in PET-CT studies, showing greater activity in lytic lesions compared to sclerotic. In an extensive study of 90 cases of POEMS syndrome published in 2015, PET-CT is considered an adequate tool for the evaluation, diagnosis, and follow-up of the pathology. It is interesting to note that the authors find that after an adequate treatment of the syndrome, avidity for FDG decreases at the same time as VEGF levels, suggesting that metabolic study could play a role in the evaluation of the severity of the process. On the other hand, the exploration allows the detection of bone lesions and possible affected lymph nodes, as well as the selection for biopsy of those with the highest metabolic index. The application of radio-guided surgery techniques (ROLL) in these last lesions would facilitate their histological study. The treatment of the pathology is based on the systemic use of corticoids, chemotherapy, or autologous transplant of hematopoietic progenitor cells, reserving the radiotherapy in case of local affectation by bone lesions. The usefulness of anti-VEGF treatments is being studied. The differential diagnosis includes demyelinating polyneuropathy, myeloma, or plasmacytoma. In this sense, patients with POEMS syndrome show a greater survival and lower age at diagnosis (fifth and sixth decades of life), in relation to patients diagnosed with myeloma. The case presented here, which involves lytic bone lesions, is rarely described in this pathology, and there are a limited number of publications that include these characteristics. It also shows the possible contribution of PET-CT in the staging of the process. The authors certify that they have obtained all appropriate patient consent forms. In the form, the patient has given his consent for his images and other clinical information to be reported in the journal. The patients understand that their names and initials will not be published and due efforts will be made to conceal their identity, but anonymity cannot be guaranteed. Dispenzieri A, Kyle RA, Lacy MQ, Rajkumar SV, Therneau TM, Larson DR, et al. POEMS syndrome: Definitions and long-term outcome. Blood 2003;101:2496-506. Dispenzieri A, Kourelis T, Buadi F. POEMS syndrome: Diagnosis and investigative work-up. Hematol Oncol Clin North Am 2018;32:119-39. Clark MS, Howe BM, Glazebrook KN, Mauermann ML, Broski SM. Osteolytic-variant POEMS syndrome: An uncommon presentation of “osteosclerotic” myeloma. Skeletal Radiol 2017;46:817-23. Albertí MA, Martinez-Yélamos S, Fernandez A, Vidaller A, Narváez JA, Cano LM, et al. 18F-FDG PET/CT in the evaluation of POEMS syndrome. Eur J Radiol 2010;76:180-2. Scarlato M, Previtali SC, Carpo M, Pareyson D, Briani C, Del Bo R, et al. Polyneuropathy in POEMS syndrome: Role of angiogenic factors in the pathogenesis. Brain 2005;128:1911-20. Michel JL, Gaucher-Hugel AS, Reynier C, Lhoste A, Philippe P, Aumaitre O, et al. POEMS syndrome: Imaging of skeletal manifestations, a study of 8 cases. J Radiol 2003;84:393-7. Shi XF, Hu SD, Li JM, Luo XF, Long ZB, Zhu Y, et al. Multimodal imaging and clinical characteristics of bone lesions in POEMS syndrome. Int J Clin Exp Med 2015;8:7467-76. Pan Q, Li J, Li F, Zhou D, Zhu Z. Characterizing POEMS syndrome with 18F-FDG PET/CT. J Nucl Med 2015;56:1334-7. Jaccard A. POEMS syndrome: Therapeutic options. Hematol Oncol Clin North Am 2018;32:141-51.